YPI CREW, the leading authority worldwide in yacht crew placement, recently published its Crew Salary Report for 2016/2017. The results are compiled from YPI CREW’s free salary-sharing platform, www.yachtingsalaries.com, which collates salary information from thousands of crew and provides transparency to the yachting industry. 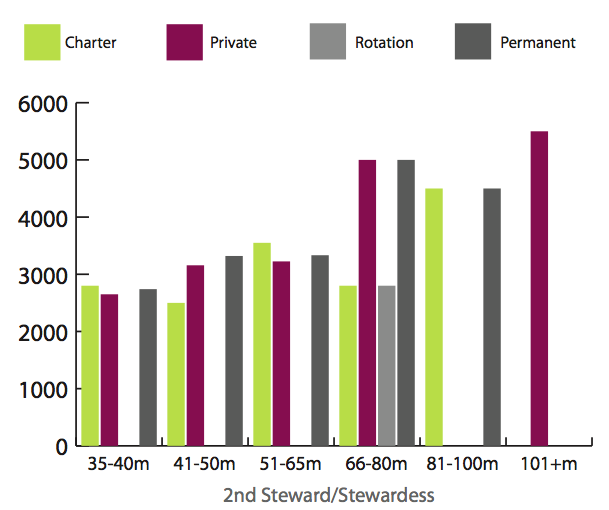 The report comprehensively outlines the average salary range for each yacht crew position, from deckhands to captains, benchmarking industry standards and providing a point of reference for employers and crew alike. The Crew Salary Report’s data is important for both employers and employees in the yachting industry. Employers need to know the current market rate so they can continue to attract top talent. Captains working on their annual budget often find it challenging to allocate specific salary rates to individual roles because the pay ranges are so broad. Similarly, crew can use the salary report to compare salaries with similar roles to make informed decisions about job offers. Above all, the platform makes job hunting easier for crew who were previously frustrated by the lack of information that surrounded pay. It also reveals how many staff are permanent, temporary, or on rotation, which provides insight into existing opportunities within the market. Yachtingsalaries.com has collected 2,500 yacht crew salary entries since its launch in March 2016. The standalone website will continue to produce reports each November to enable crew salary comparisons from one year to the next. The site works on an honesty-based system, whereby candidates answer a few questions and share their salaries anonymously. In return, they can access specific salary data from people with similar profiles. The site is constantly updated as new salary profiles are added by captains and crew every day. The results are divided into crew categories, types of contract, and by vessel size, which range from small yachts to superyachts that exceed 100m in length. Crew can filter their searches by the type of yacht or the type of contract. The Crew Salary Report responds to a real need for transparent information within the yachting industry. It was created with the aim of freely sharing information and making the industry a level playing field for all candidates. Unlike most annual surveys, Yachtingsalaries.com is updated in real time and information can be searched instantly. Although created by the YPI CREW recruitment agency, yachtingsalaries.com is an independent entity, meaning there is no incentive for people to enter misleading information. Members of the community can report any inconsistent or inflated salaries as suspicious and they will be removed immediately from the system to maintain the platform’s accuracy and integrity. Of the 446 captains that submitted salary information, 83% work on motor yachts and 17% work on sailing yachts. The trend followed expectations insomuch as captains of larger vessels tended to earn higher earnings, with private and permanent contracts paying especially well for 50-65m sailing yachts and 81-100m+ motor yachts. 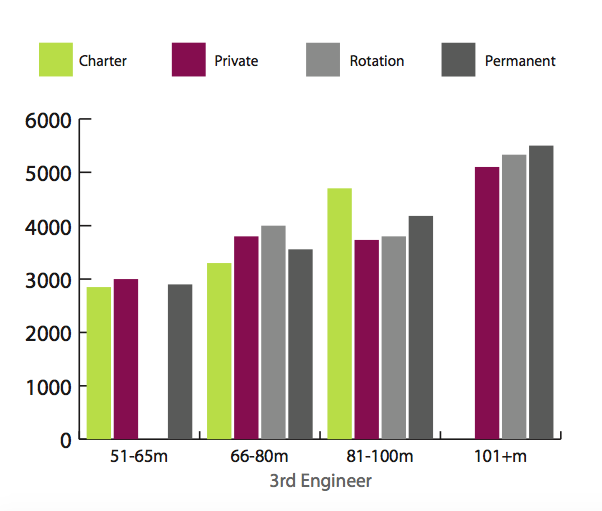 Only 1% of sailing yacht captains and 15% of motor yacht captains are on rotation, with salaries starting at €5,500 per month for both. However, motor yacht captains on rotation can earn almost €16,000 per month for large vessels, whereas sailing yacht captains on rotation earn an average maximum of €8,000 per month. 434 technical crew contributed to the results – 239 of which were chief engineers. 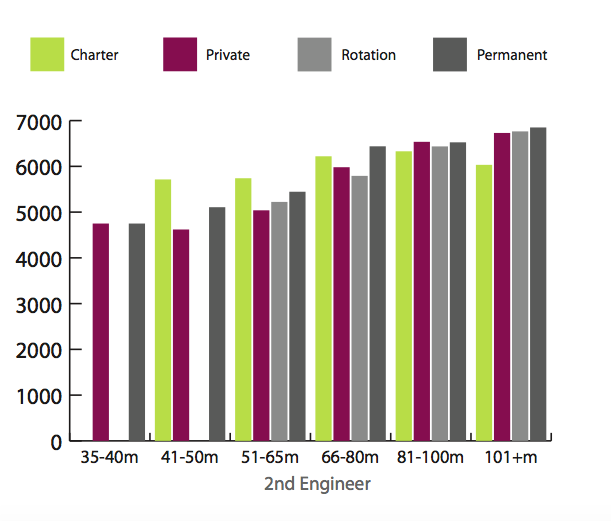 On superyachts over 101m, chief engineers earn an average €12,000 per month while on a permanent contract. 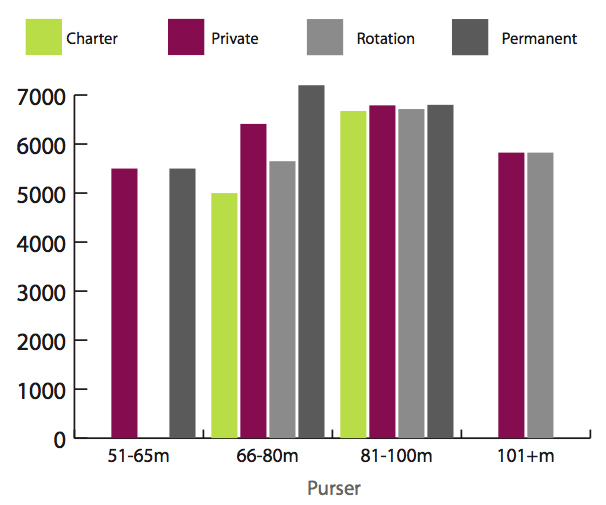 Those on rotation and charter yachts earn an average maximum of €10,000 per month. Meanwhile, 109 second engineers reported a salary range of €4,500-€7,000 per month, depending on the vessel’s size. Third engineers reported earnings of €3,000-6,000 per month. 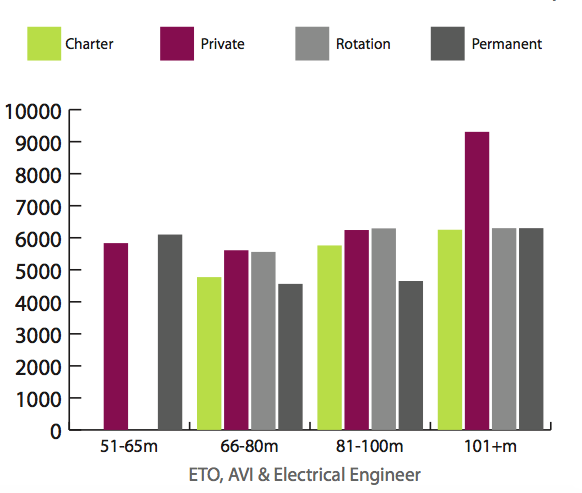 Surprisingly, ETO’s, AVI’s and electrical engineers benefit most from rotation and earn more consistently at the higher end of the €4,000-€6,500 per month range, irrespective of the size of the vessel. 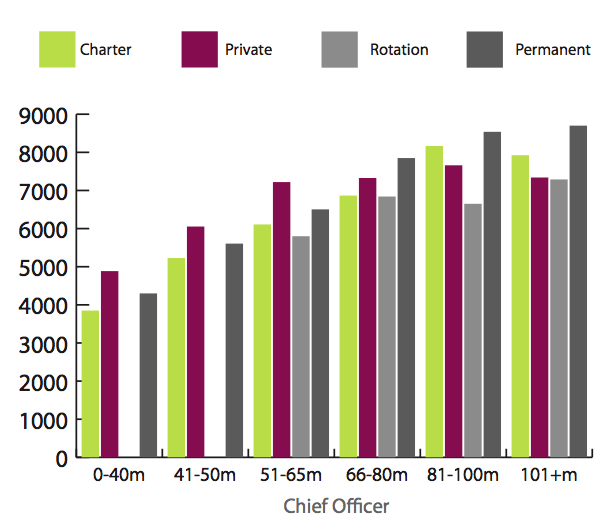 The data from the 224 contributing deck officers reveals that only 31% of chief officers command a rotational position. 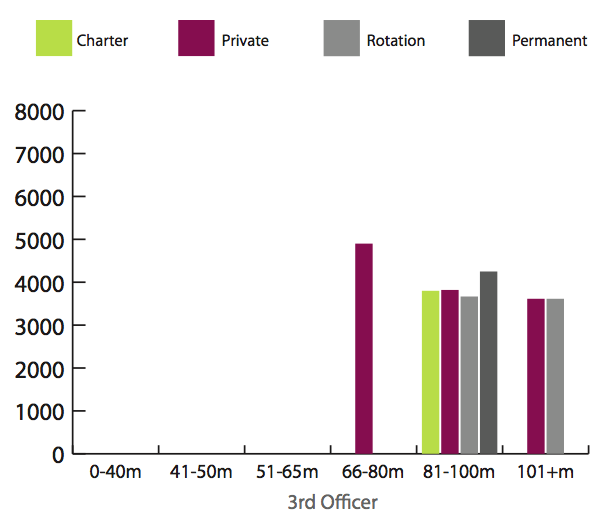 The results revealed that second and third officers are much more likely to hold rotational positions, with 50% and 70% respectively. 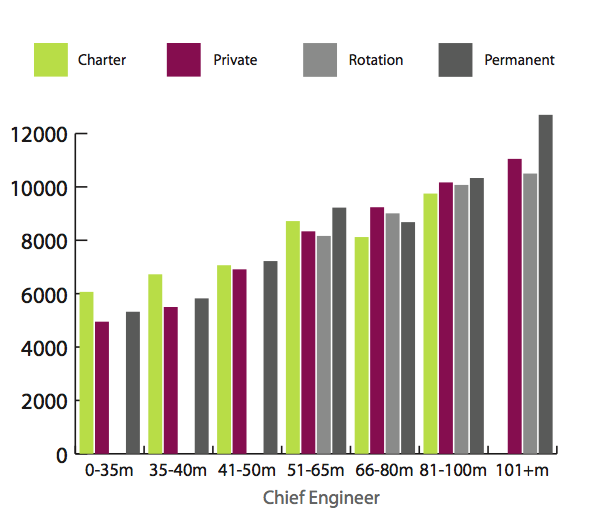 Deck salaries remain relatively constant on mid-sized and larger vessels. Chief officers in permanent positions earn up to €9,000 per month on the largest yachts. 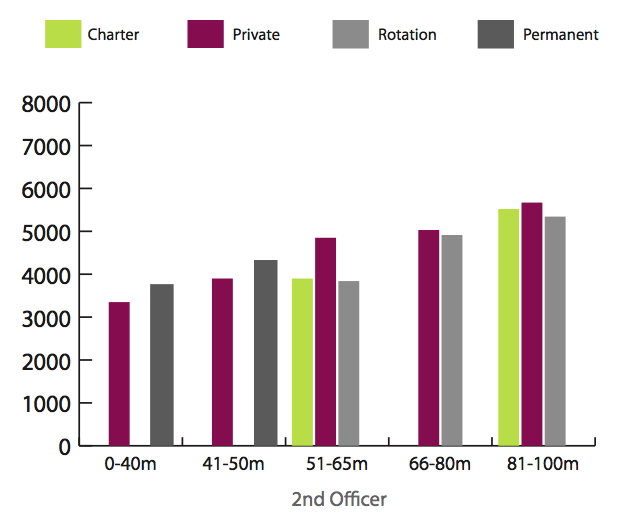 Second officers earn more consistent rates across a range of vessel sizes and contracts, averaging €4,500 per month. Third officers earn around €4,000 per month on yachts over 65m, but earn up to €5,000 in private positions on 66-80m yachts. 18 sole mates reported earnings of €3,500-€4,500 per month with a rare permanent position on a 60m yacht generating an income of almost €6,000 over the same period. 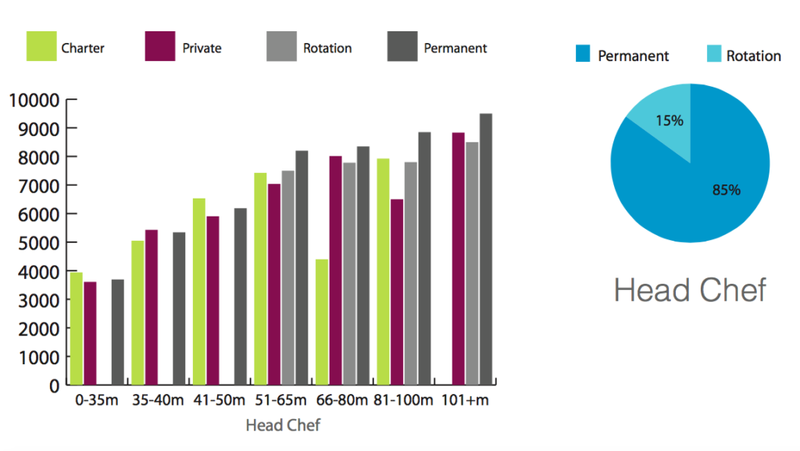 The majority of chefs are permanent staff: just 15% of head chefs and 29% of sous chefs are on rotation. 127 chefs contributed to the survey but no definitive pattern was revealed, which indicates the varied pay scale of the position. 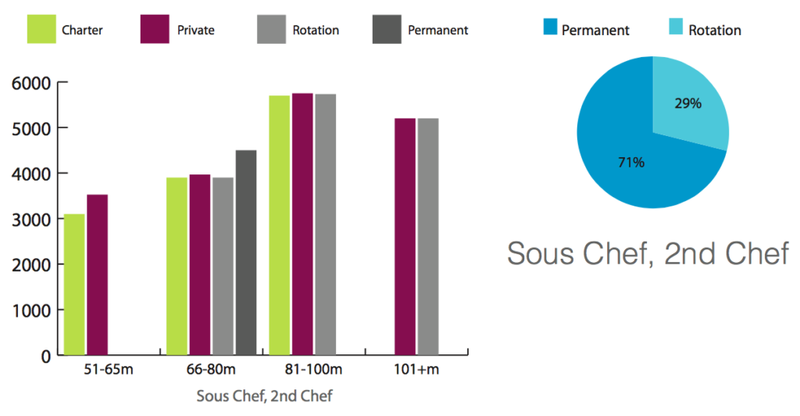 Head chefs’ salaries range between €3,500-€10,000 per month, depending on the size of the vessel, but with some anomalies. The pay scale for second chefs varies from €3,000-€6,000 per month with yachts in the 81-100m range offering the highest wages in private, rotation and charter positions. 27 pursers contributed their salary details, revealing a stable remuneration across all vessel sizes, with an average maximum earning potential of €7,000 per month. Around 60% of pursers are on rotation, compared to only 13% of chief steward/esses. 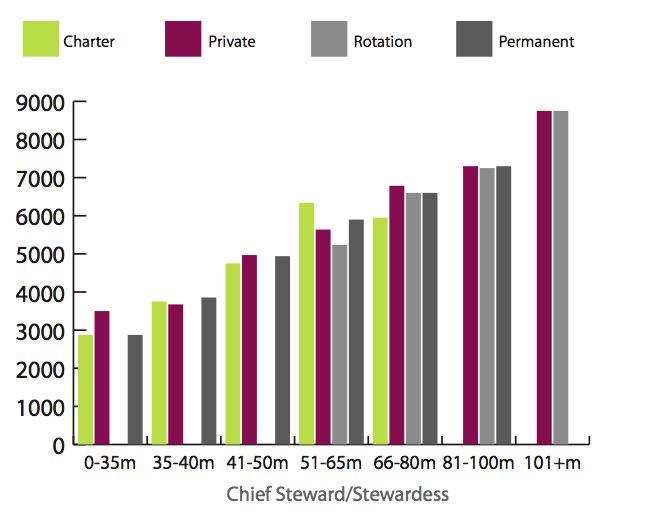 The 68 chief steward/esses who contributed earn an average of €3,000 per month on small vessels with the amount steadily increasing to €9,000 per month for employees on the largest yachts. Just 27 second steward/esses contributed information, so there wasn’t enough data to reveal any patterns, but the pay spectrum starts at under €3,000 and goes up to €5,500 per month. 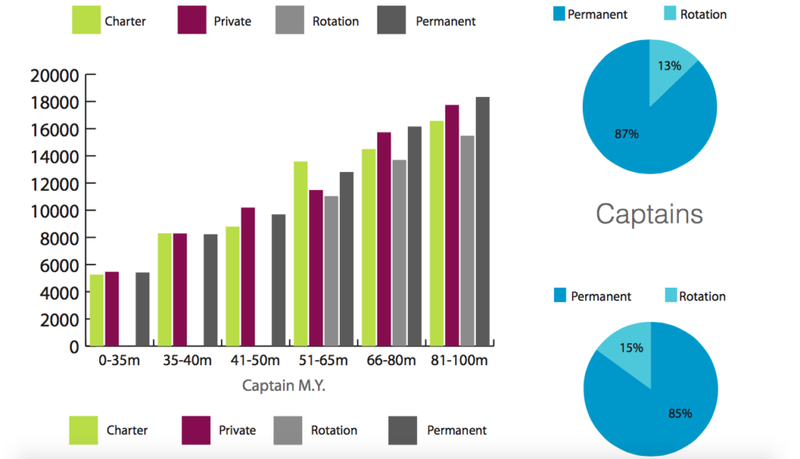 Only 87 deckhands contributed their details, but the data reveals that they have the most consistent ranging salaries of all crew. 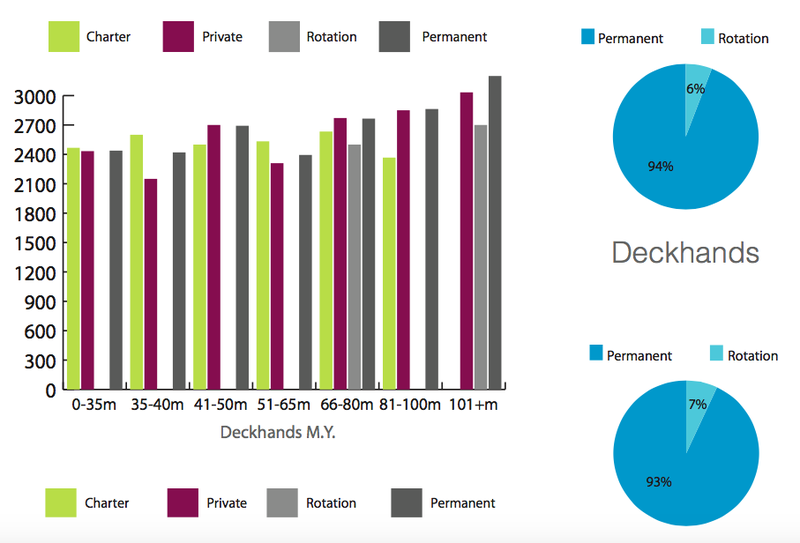 Only 10% of deckhands are on rotation and deckhands can expect to earn between €2,100 and €3,000 per month.